When last we reported on American Sniper, Steven Spielberg was set to direct Bradley Cooper as Texas Navy SEAL Chris Kyle, who has recorded the highest number of sniper kills for an American soldier. The film was set up to be a co-production of Warner Bros. and DreamWorks, but now Spielberg and DreamWorks have exited the picture, leaving WB free to seek another director. The latest report cites an inability of Spielberg to line his vision for the film up with its allotted budget. Cooper, who remains attached to star as of this writing, is also a producer on the picture. Hit the jump for more. Deadline reports that Spielberg and DreamWorks will no longer be involved with American Sniper. Recently, Spielberg put another planned adaptation on the shelf for an indefinite period of time. The film in question was an interpretation of the Daniel H. Wilson sci-fi novel, Robopocalypse. The reason for that delay was apparently a wish on Spielberg’s part not to rush the project into production before it was ready. While progress on Robopocalypse has been assured, it looks like American Sniper will have to find a new helmer before moving forward. He is the deadliest American sniper ever, called “the devil” by the enemies he hunted and “the legend” by his Navy SEAL brothers . 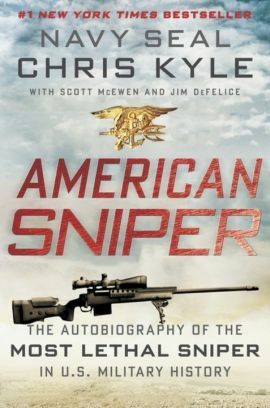 . .
From 1999 to 2009, U.S. Navy SEAL Chris Kyle recorded the most career sniper kills in United States military history. The Pentagon has officially confirmed more than 150 of Kyles kills (the previous American record was 109), but it has declined to verify the astonishing total number for this book. Iraqi insurgents feared Kyle so much they named him al-Shaitan (“the devil”) and placed a bounty on his head. Kyle earned legendary status among his fellow SEALs, Marines, and U.S. Army soldiers, whom he protected with deadly accuracy from rooftops and stealth positions. Gripping and unforgettable, Kyle’s masterful account of his extraordinary battlefield experiences ranks as one of the great war memoirs of all time.